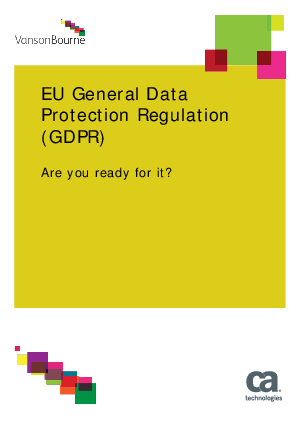 > Research Library > CA Technologies > The EU General Data Protection Regulation (GDPR) - Are you ready for it? Explore survey results on the readiness of organizations to meet the compliance needs of the GDPR. Given the GDPR is set to have wide-ranging implications for the type of data that can be used in non-production environments, CA Technologies wanted in particular to understand how companies are planning for the GDPR and what processes and technology is needed to help them. Explore the results of a survey to understand the readiness of organizations to meet the compliance needs of the GDPR.